Break the recipe code for your favorite foods! 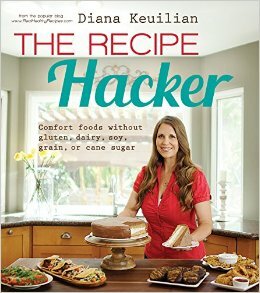 Free of grains, gluten, dairy, cane sugar, and soy, The Recipe Hacker is a mouthwatering collection of your favorite comfort foods with a healthy twist. Learn to use easy ingredient substitutions to transform traditional dishes into real, healthy comfort food masterpieces, without sacrificing any flavor! Enjoy healthier, whole-food versions of Key Lime Pie, Crispy Orange Chicken, and Banana Pancakes. Dozens of recipes and delicious flavors will keep you coming back for more. Enjoy all the comfort foods you crave and keep your body (and skinny jeans) happy at the same time! I was surprised by their enthusiasm and also by the recipes they chose! I myself was looking a the mint chocolate chip ice ream made with coconut milk, key lime pie, frosted watermelon cake and passion fruit sorbet. This cookbook is all about eliminating gluten, refined sugar and dairy while keeping the appeal of the food. It is well designed and easy to follow. Thumbs up from my family’s hardest to please! Diana Keuilian is passionate about creating wholesome versions of your favorite foods. She removes the gluten, dairy, soy, grains and cane sugar from traditional comfort food recipes like cake, tacos, cookies, waffles, enchiladas and more. This hobby propelled her to start the popular blog, RealHealthyRecipes.com, where she shares hundreds of delicious recipes and mouthwatering photos. She lives in Southern California with her husband and two young children. For more recipes, or to contact Diana, visit RealHealthyRecipes.com and www.facebook.com/RealHealthyRecipes.